With so many choices out there for where you can make your wagers, it can be difficult to decide which one is going to be the right fit for you. At first, you’re probably just looking for games that you like, but it quickly becomes evident that there’s much more to it than that. Does this casino take players from my country? Will that one accept my credit card? How do I know these guys are going to pay if I win? Are all these bonus offers for real? Trying to find an online casino that’s everything you want it to be is no easy task. There’s a lot to consider, and a wrong choice could very quickly separate you from your money with absolutely no chance of getting it back. That’s where we come in. You can easily see that we’ve looked through our share of online casinos and, most importantly, we’re not afraid to call out the shady operations and expose them for what they are. On the other side of the coin, we’re also very happy to show you the true stars that shine brightly out here in cyberspace. With that in mind, we’d like to show you some gems that we’ve recently come across. And best of all, we’ve put together a special selection of casinos that should cover just about anyone, no matter where in the world you happen to be. So without any further ado, here are our top three new casinos that rock! Casino Max is one of just a handful of online gambling sites that accepts players from the United States. They are by no means a last resort, though. 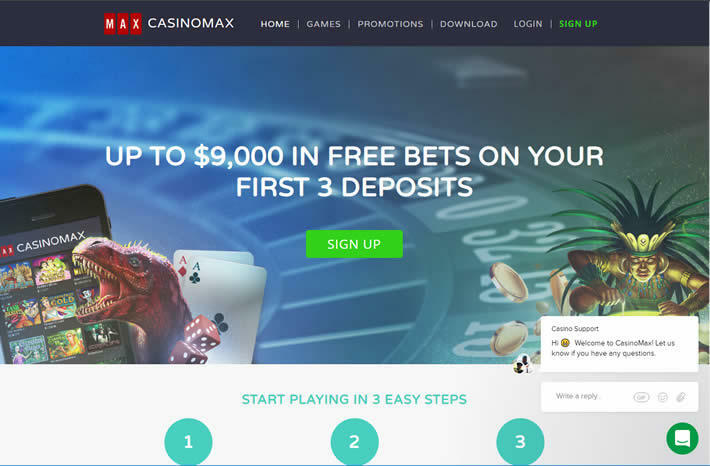 Where other USA friendly online casinos rest easy thinking the US players have nowhere else to go, Casino Max is rolling out the red carpet and giving players the experience they deserve. Casino Max is powered by RTG gaming, one of the top gaming industry development studios. Players will find a full selection of casino favourites. All of the table games are available, including roulette, blackjack, craps, poker, and more. There is also a wide variety of slots from classic to modern designs and progressive jackpots, too. Most of their games are playable without an account, so you can look around before you sign up as well. The welcome bonuses will blow you out of your seat. If you like the slots, you can get a 300% bonus in free bets on the slots up to $3,000. As if that weren’t enough, you can get the bonus on your first THREE deposits. The math isn’t too hard here. That’s a bonus of up to $9,000 to play on the slots! If the slots aren’t your thing, you can get a 100% bonus up to $1,000 to play on the table games! All new players can also get 20 free spins on the slots every day for ten days. Casino Max also makes it easy to move money in and out of your account. Players can deposit using Visa, Mastercard, or Bitcoin and withdraw via check, bank wire, or Bitcoin. If you’re in the U.S., you’ll have a hard time finding an online casino that’s going to treat you better than Casino Max. For additional information about the best casino banking for USA players, you can check our detailed guide. Australian casino players have seen their choices of online casinos steadily dwindle lately. That doesn’t mean there’s nowhere left to play, though. And it doesn’t mean you’ll have to settle for mediocre games and shoddy customer service either. Gunsbet Casino is a top-notch establishment that provides players with a multitude of games as well as a great selection of banking options for Australians. Gunbet works with no less than 17 different game providers. Players will find hundreds of high-quality video slots as well as table games like roulette, blackjack, and hold’em, along with live dealer casino games. Gunsbet offers 20 different payment methods for getting fund into or out of your account, most of them with instant processing. You’ll be able to move money using Visa and Mastercard, most of the e-wallet solutions like Neteller and Skrill, bank transfers, and even Bitcoin. Whichever method you prefer, Gunsbet will most likely work with you. They will also accept funds in nine different currencies including Dollars, Euros, Australian Dollars, Russian Roubles, and more. If you’re looking for bonuses, Gunsbet Casino has you covered there, too. 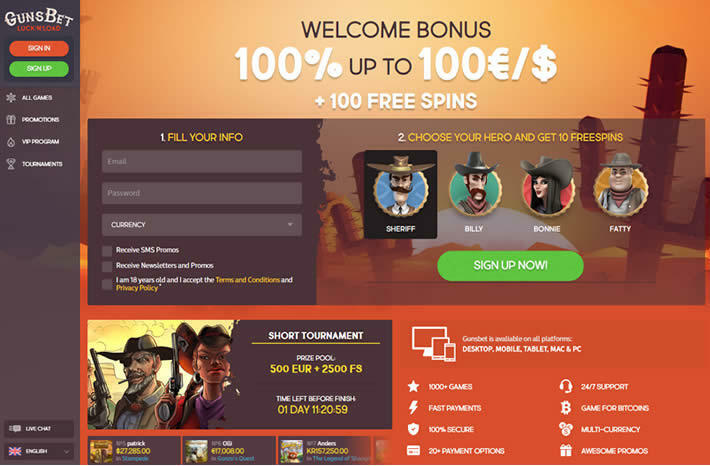 There’s a 100% welcome bonus up to €100 plus 100 free spins on the slots. Every Friday they’ll also give you a 55% deposit bonus up to €50, and there are regular tournaments with great prizes. Best of all, the bonuses here are cashable bonuses. Players can also move through seven different VIP levels to earn even more rewards and bonuses. For more information about the best casino banking in Australia, you can always visit our dedicated section with tips and tricks, including the best methods available. Casino players in the UK and Europe generally have a lot more choices when it comes to choosing an online casino, but that’s all the more reason to make sure you’re getting the best. With so many choices out there, there’s absolutely no reason you should settle for anything less. That’s why we think you should have a look at Red Queen casino. All you have to do is visit their site and you will immediately notice that there’s something different about this online casino. The design is classy and understated. There are no claims of being the best, no crazy flashing bonus signs, and no wacky cartoon characters. The site is clean, well-designed, and just exudes elegance. 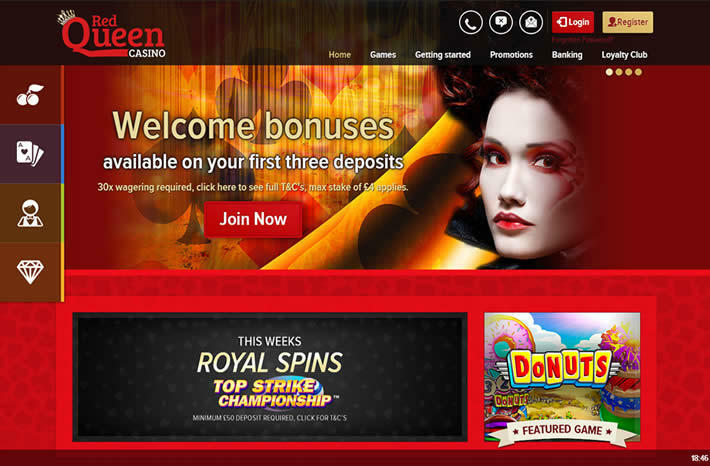 Red Queen works with more than 20 different gaming providers, so you can just imagine the selection of games you’ll find inside. You’ll find well over 1,000 different video slots, all the table games you’d expect to see in any reputable casino, live dealer games, virtual sports, lotto games, and more. Of course, there are also generous bonuses to be found, both as a new player and as a returning player. As a new player, there is a three-tiered welcome bonus on your first three deposits. You’ll get a 150% bonus up to £100 on the first deposit, 100% up to £200 on the second, and 50% up to £250 on the third. Returning players can earn up to 50 free spins on the slots by depositing £50 or more, and there are also regular promotions happening that will dish out more rewards. Banking options are also, of course, plentiful. Players can move money in and out of their accounts with Visa, Visa Delta, Mastercard, Visa Electron, Entropay, Solo Debit Card, Laser Debit Card, Neteller, and Skrill. If you want to know more about the best casino banking in UK, feel free to visit our dedicated section providing the best tips and tricks for fastest withdrawals. So there you have our top 3 new casinos that rock! We’ve looked near and far to find the cream of the crop. No matter where you are, we’ve got you covered. One of these three online casinos should be able to deliver the kind of fun, quality gaming experience that anybody willing to wager their hard earned cash is entitled to. Fortunejack Equality Day Bonus! Woot!